Leninsky Prospekt (Russian: Ле́нинский проспе́кт) is a station on the Kirovsko-Vyborgskaya Line of the Saint Petersburg Metro, located between Avtovo and Prospekt Veteranov. The station was opened on September 29, 1977 in the section between Avtovo and Prospekt Veteranov, replacing the temporary surface station Dachnoye. It is named for its location along the street of the same name. There is no above-ground pavilion; entrance to the station is provided through underground pedestrian crossings, with exits onto Leninsky Prospekt and Bulvar Novatorov. Because of the station's shallow depth, neither exit has escalators. Leninsky Prospekt is a shallow column station with a depth of 8m. The underground hall was constructed as a project of the architects A. S. Getskin and Ye. I. Val and the engineer A. N. Yakovlev. The design of the station echoes Lenin's Mausoleum. 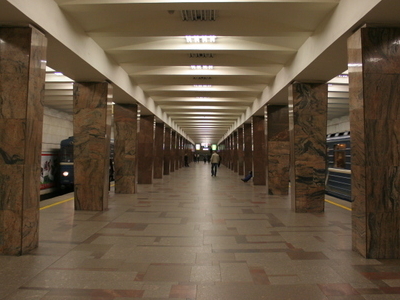 The platforms and the columns, which widen at the top, are faced with red Karelian granite. Unpolished white marble is used to decorate the walls. Until the early 1990s the station was unique in its quadruple commemoration of the name of Lenin in its friezes: "V. I. Lenin Metro of Leningrad, order of Lenin. Leninsky Prospekt Station." Here's the our members favorite photos of "Metro Stations in Saint Petersburg". Upload your photo of Leninsky Prospekt!